You find meaning everywhere. You pay attention to the wonder of discovery and connections. You do reverence and laughter. You're looking for music that resonates. Call it folk music because it's all about relationships and stories. Their music speaks to people of all spiritual traditions or no tradition. They sing for deep-breath mystery, open-hearted life, trust and change. 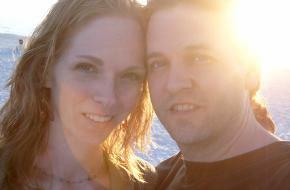 Partners in music, singer/songwriters from small-town Iowa.